Stellar Windows Data Recovery facilitates a facile and risk-free recovery of lost files, photos, emails, documents, movies, and more. The software supports recovery of more than 300 file types to offer high degree of scalability. Unveiling the all-new Stellar Data Recovery Premium — a software that truly pairs the potential of a simple DIY interface with innovative data recovery. Permanently deleted files, corrupt or formatted hard drives, inaccessible volumes and what not...Stellar Data Recovery Premium gets back all the lost data and now also repairs corrupt Videos and Photos! 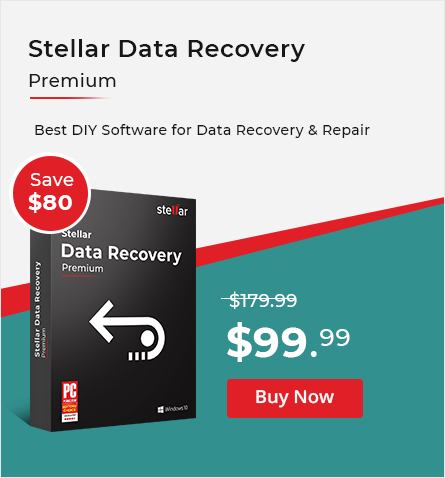 Stellar Data Recovery Professional for Mac combines impressive recovery capabilities and elegant interface to help you resurrect lost files on any APFS, HFS, FAT, ex-FAT, or NTFS formatted drives and volumes. The software can recover text documents, photos, music, videos, database files, and more. Stellar Data Recovery Premium for Mac is an excellent data recovery tool for home and professional users who are looking for a D-I-Y application that caters deleted file recovery, disk cloning, photo repair and video file repair. Photo recovery software for Windows based computers, which supports recovery of lost, deleted, or inaccessible photos, videos, audios, and other multimedia files. Reliable software recovers photos from laptops, desktops, memory cards, iPods, USB flash drives, digital cameras, memory sticks, SD cards, IBM Micro Drives, Hard Disk etc. Mac photo Recovery Software that incorporates many innovative algorithms to recover lost/deleted photo, audio and video files. This software has an interactive user interface, which allows you to recover your precious photos in few simple steps – 'Select' 'Scan' and 'Recover'. Stellar Photo Recovery Professional recovers lost videos, photos and audios as well as repair corrupt and damaged photos. It restores the multimedia files with its original visual quality intact. Stellar Photo Recovery Premium restores back your lost videos, photos and audios. It is a unique all-in-one software, which can not only recover your lost multimedia files but also repair corrupt photos and videos. Stellar Repair for Video is a professional tool to rebuild damaged header, sound, format, movement and duration corruption of video files. After repairing corrupt video files, it facilitates to view result in preview mode. Photo Repair Software that repairs damaged or corrupt image files having JPEG, CRW, DNG, NEF, TIFF, ORF, PEF etc. This efficient photo repair software repairs severely corrupt photos using sample files. Stellar Repair for Photo easily recovers corrupt JPEG/JPG & other images damaged due to a failed transfer operation, virus infection, power outage, and similar causes. The utility provides preview of all the recovered images prior to saving them to your system. Smart iPhone Data Recovery Software to recover Photos, Text, Videos, Chat, Contact etc from any iPhone, iPad and iPod running the latest iOS 11. You can also restore files from iTunes and iCloud backup by directly logging in to iCloud account (inbuilt into software interface). Windows Password Recovery Tool to recover lost or forgotten passwords of Windows administrator and other user-login accounts. In addition, the software is adept at retrieving the passwords used in various email clients, web browsers, FTP clients, and chat messengers installed on your computer. Server Password Recovery helps you easily recover/reset the password of any Windows Server based computer that is acting as a domain controller. The software has a safe approach to Server password recovery. You can quickly recover your password without modifying the system settings or data. PDF Recovery Software that repairs corrupt or damaged PDF files without changing their original formatting. This file repair software can remove various restrictions applied to PDF file and also can extract images from working PDF files. Stellar Converter for Audio Video File utility is available for Windows OS and Mac OS X. This productive software offers options to convert audio-video files as per convenience. Moreover, user can also edit video files as per his/her choice. Word Recovery Software that repairs damaged or corrupt MS Word files without changing their original formatting. Reliable file repair tool repairs corrupt MS Word file having .doc or .docx extension.